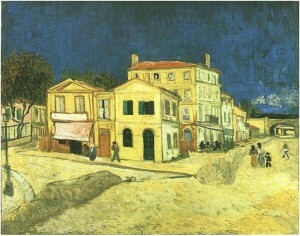 In February of 1888, Post-Impressionist artist Vincent van Gogh rented rooms in a small yellow house on the Place Lamartine in the provincial town of Arles in Southern France. It was Van Gogh’s dream to start a Studio of the South, a colony where artists would be able to work in collaboration. In a letter to his brother, Theo, in early May, after becoming situated in the Yellow House, Van Gogh expressed an interest to have someone join him in the studio, perhaps friend and fellow artist, Paul Gauguin. Gauguin was open to the idea though it took him some time to finally arrive, which raised the anxiety level of the troubled Van Gogh. While anticipating the arrival of Gauguin to the Yellow House, Van Gogh painted a series of sunflowers to adorn the walls of the studio, specifically Gauguin’s room. By the time Gauguin arrived at the Yellow House on October 23, 1888, the house was filled with Van Gogh’s canvases, including several of sunflowers. 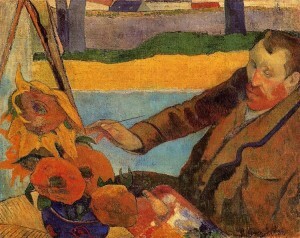 In December, during his short stay at the studio, Gauguin completed a portrait of Van Gogh which depicts him painting the famous sunflowers, The Painter of Sunflowers or Van Gogh Painting Sunflowers. Van Gogh did not immediately love the painting, feeling that the depiction made him look mad, however, his views later softened and he grew to appreciate the work. During Gauguin’s time at the Yellow House with Van Gogh, the two artists found that they did not see eye to eye on a number of things, including painting. A frequent point of contention was whether painting from nature or from imagination was best. Van Gogh appreciated painting reality and from nature while Gauguin, created many of his works based on his imagination or memory. 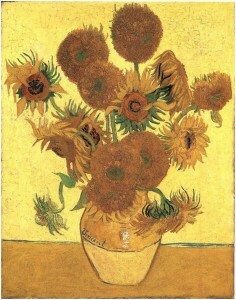 Van Gogh Painting Sunflowers is an example of this artistic difference. In the painting, Van Gogh is sitting at his easel with a bouquet of sunflowers next to him as he paints, depicting Van Gogh painting from nature. However, because the painting was created in December, we know that sunflowers would not have been easily on hand so the artist, Gauguin, created the painting from his memory or imagination.